US Coast Guard Prevention Blog: Say No to Drugs, Say Yes to Shipriders—Part I: What’s a Shiprider? Say No to Drugs, Say Yes to Shipriders—Part I: What’s a Shiprider? Excerpt from U.S. Coast Guard “Proceedings of the Marine Safety & Security Council” magazine by LCDR Brian W. Robinson, U.S. Coast Guard Operations Law Group. So you’re losing sleep about the multitude of threats to legitimate maritime traffic, eh? Who could blame you? With drug runners using vessels of every type to move tons of cocaine around the world, pirates attacking and hijacking everything that floats off the Horn of Africa, and rogue fishing vessels devouring everything in their path with driftnets, there is plenty to worry about. Fortunately, there’s hope. The U.S. continues to complete bilateral agreements with partner states around the globe that extend the ability of the Coast Guard and other maritime law enforcement agencies to check illegal activity. Shiprider agreements, by which U.S. Coast Guard personnel and foreign maritime law enforcement officers literally ride on each other’s ships, are at the core of this strategy. Put simply, law enforcement authority is portable and travels with the officer. When foreign shipriders embark in U.S. patrol assets, it extends the authority of that asset to patrol in waters and to board vessels that are subject to the shiprider’s jurisdiction. Shiprider operations are particularly effective in coastal waters that smugglers often exploit with “go-fast” vessels. In a typical go-fast case, there is very little time to obtain authorization from a coastal state to pursue a suspect vessel into territorial seas. 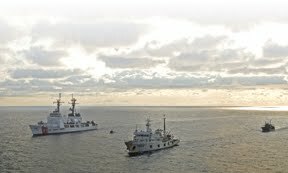 By the time the state gives authorization to pursue into its territorial seas, the go-fast may be long gone. However, when a shiprider is aboard a U.S. patrol asset, the shiprider has authority to act immediately and authorize pursuit and entry into the territorial seas of his home state. Part two shares success stories.